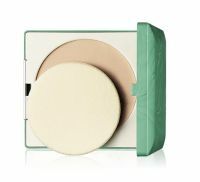 Every girl needs a good blot now and then, and that's how this powder earns its stripes. The thin peach sponge does a fair job mattifying trouble spots and giving a deliberate satin finish to the T-zone. Be sure to blend with fingertips for a natural look. The sponge does collect skin oils, and it gets grungy, so be sure to wash it weekly with a light facial cleanser. I didn't seem to notice any particularly mattifying effects from using this powder. It has an average length of wear. It's an okay powder, of average quality. The case isn't cute, but it's sturdy and holds up well. It's just OKAY. There isnt' anything really great about it, and it doesn't do what it says it'll do, but it doesn't make anything worse either. Pretty good powder. It smells kind of nice and makes my skin matte. The powder is smooth and soft but there isn't anything incredibly special about it. It holds my foundation for a good chunk of the day.